Purchase this product now and earn 65 BIObucks! Biodroga MD CLEAR+ Anti-Aging Care for Impure Skin offers anti-aging ingredients, vitamins, and encapsulated Retinol to provide a clear, firm complexion. Makes the skin supple again and supports it’s natural functions. 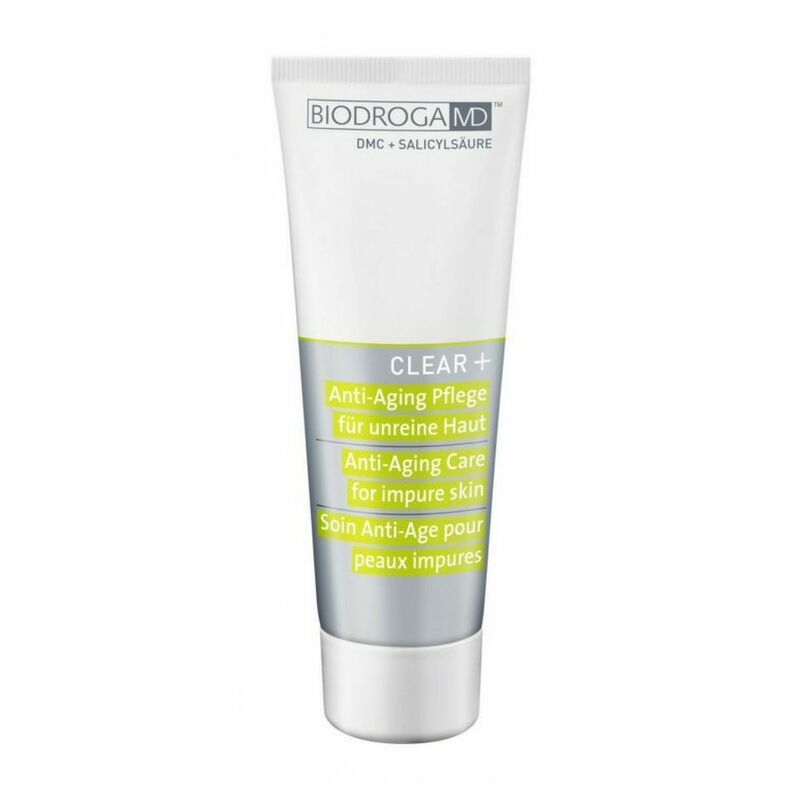 Targets blemish and cornification disorders and dissolves old skin flakes that clog pores. Moisturizes and replenishes oil. Stimulates formation of new skin cells. Protects the skin against environmental factors. Counteracts the spread of harmful bacteria which trigger skin blemishes. 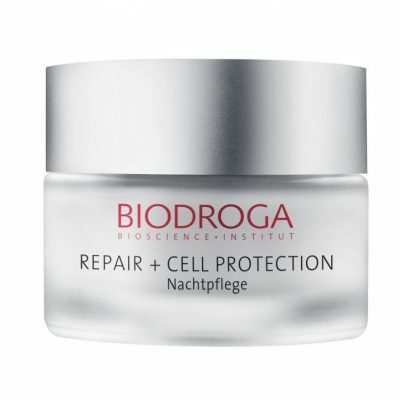 No mineral oil, synthetic fragrances or colors, PEG, sulfates, silicones, phthalates, animal substances or parabens used in Biodroga MD products. No animal testing. 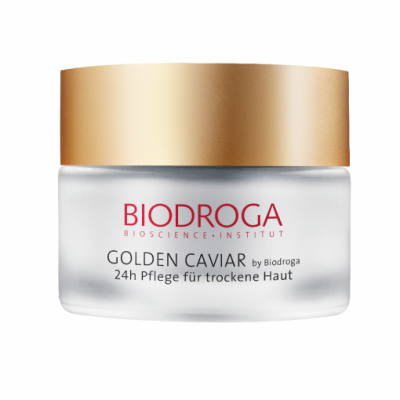 Special nourishing cream for mature skin with restructuring effect and barrier protection. Stimulates formation of new skin cells. Prevents the unwanted cornification process. Makes skin appear even and youthful. Counteracts the spread of harmful bacteria which trigger skin blemishes. Nurtures the natural healthy skin flora. Mornings and evenings, apply to cleansed skin. For best results cleanse skin with Clear+ Cleansing Fluid and Clear+ Clarifying Lotion. Salicylic Acid, Vitamin A, D-Panthenol, Beta Glucans, Safflower Seed Oil, Linoleic Acid, Vitamin E Acetate, Jojoba Oil, Encapsulated and Stabilized Retinol (Vitamin A), The Clear Complex (Bioecolia and Magnolia Officinalis Bark Extract). Salicylic acid targets blemishes and cornification disorders and dissolves old skin flakes that clog pores. D-panthenol soothes slight redness and irritation and prevents inflammatory processes. Beta glucans are derived from plants; they stabilize the skins moisture and reinforce important skin protective functions. Safflower seed oil contains high levels of linoleic acid which means it has an oil-replenishing effect that is important for dry skin. Vitamin E acetate has antioxidant properties and reinforces the ability of the skin to retain moisture. It also boosts the formation of new skin cells. Jojoba oil provides the skin with moisture and nourishment. Encapsulated and stabilized retinol (vitamin A) gradually exerts it’s effects and delivers a sustained anti-aging effect. Retinol boosts the rate of skin cell division and the development process of the epidermis. Vitamin A restructures the skin and has a positive effect on the cornification process. The Clear Complex, consisting of bioecolia and magnolia officinalis bark extract, counteracts the spread of harmful bacteria, particularly Propionibacterium species, which trigger skin blemishes. At the same time, the complex nurtures the natural healthy skin flora. I love this product. I never knew what to do for my skin because I wanted something that was anti-aging but also helped with my breakouts. This cream is perfect!! !